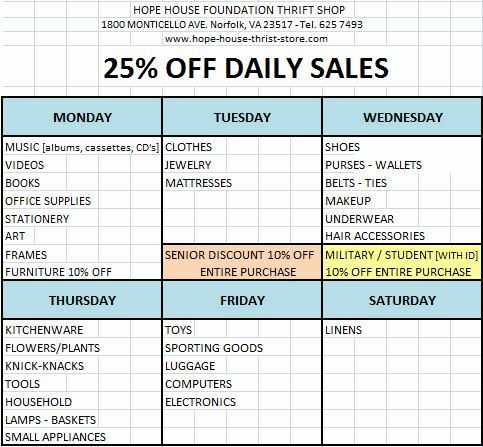 Every day is sale day at the Hope House Thrift Shop. We have so much great stuff to put on our sales floor, we need to move our merchandise quickly. Every day of the week the items in different departments are discounted 25% off the ticketed price [details below]. Seniors receive 10% off discount every Tuesday. Students and Military receive the same discount on Wednesday. In addition to the daily sales posted above we offer bi-monthly sales that are changed every 1st and 16th of each month. Below is a calendar of our promotions. Want a discount coupon for your next purchase? Just subscribe to our mailing list, and we’ll email you a printable coupon. ...and stay up to date on the store sales and events!